Posted on 8/27/2018, 1:12 pm, by kittykill, under Meatless Monday. It might be the cooler temperature that I am experiencing but I need some comfort food! I don’t want to spend a ton of time preparing. I want to fix it and get back to crafting. 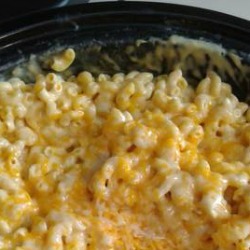 Lucky for me, Craftster member bethntim decided to share her recipe for Crock Pot Mac and Cheese. This recipe is by no means vegan. It has a lot of butter, cheese and other dairy products in it. It is meat free and can be altered to be completely animal product-free. Pair this dish with a tasty fall veggie salad or, for even more decadence, faux bacon or chicken. Crock Pot Mac and Cheese is also a great side dish for potlucks and backyard BBQ’s. No one can ever be mad at you for bringing this beauty to the party. If you want to turn up the heat, add peppers or other spices for a different taste. Our Cooking Board is full of recipes whether you cook with a crock pot, instant pot or on a stove top. Stay comfy!